The roads are clear and the airport is barren. No lines. After the crowds of last night it was weird to see the place so quiet. 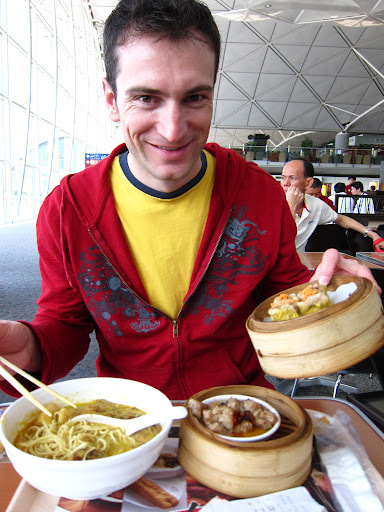 Since we missed having the good HK dim sum, we had the famous HK airport dim sum. It's good and all, but I think the Chinese lady at work has made better dumplings. To get to Pnhom Penh we connected in Bangkok. And coincidentally our friends Blaine and Leah were connecting at around the same time we were. Since we had time to kill we thought we'd try and see them at their gate. But Suvarnabhumi airport is huge and I'm fairly confident that we walked nearly 2km to get from our gate to theirs. And since the airport is built so that incoming and outgoing passengers are separated, we had to avoid security (and a cleaning lady) to get there. Upon arriving at the gate we could not see them. We knew they had a tight connection and were beginning to wonder if they'd made it. Suddenly Julie started banging on the glass partition and yelling Leah's name. But those two had just sprinted the distance we had just casually walked and were borderline delirious so it took them a moment to see us and then recognize us. Using frenzied sign language and doodles on our tablets we managed to determine that we'd see them at our hotel in Phnom Penh. Great to hear that you are on the road again. Cambodia is a great place to travel to. I backpacked there about 12 years ago and I really enjoyed it. I'm curious to hear your stories about the country and to see if anything has changed. It was pretty bareboned when it came to travelling infastructure back then.